An inside the waistband holster that meets the requirements for deep concealment. This design features a high back that provides a shield between the body and the sharp edges of the pistol. The belt clip provides easy on/off convenience, yet securely anchors the holster to the belt. Great fit. You offer Bianchi at a great value, thanks. The best holster I own, very comfortable to wear and very easy to get to my weapon. Fit my 27 really tight, has not loosened up much. Clip doesn't stay on belt liked I hoped. Love this holster very comfortabe. Fits my 1911 very well. This holster is surprisingly comfortable. I would recommend this product. The leather is thin - but tough - which is perfect for concealed carry. It fits my Sig P6 perfectly. I couldn't be happier. Great holster for my old Walthers. Works as advertised- like the steel clip. Purchased to carry S&W 6906. Jury is still out on whether to keep & carry this or trade for one of the newer "plastic" single stack guns. Yes, it will fit the Glock 23. Does this fit a Sig P229 with rail? Yes, it will fit Sig Sauer P229R. 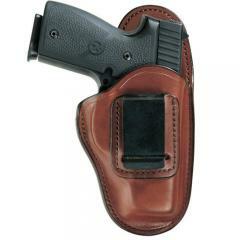 Bianchi 100 Professional Waistband Holster with Suede Backing fits M&P Full size and Compacts. Description says fits ruger sp101 2". will it fit 2 14" ? Yes, it will fit Ruger SP101 with a 2.25" bbl.